The Hong Kong government started developing "New Towns" in the 1950s, in order to accommodate Hong Kong's booming population. At the first phase of development, the newly developed towns were called "satellite town", a concept borrowed from the United Kingdom, of which Hong Kong was then still a colony. Kwun Tong, located at eastern Kowloon, and Tsuen Wan, located at the south-west New Territories, were designated as the first two satellite towns, when the urban area in Hong Kong was still relatively small, restricted to the central and western part of Kowloon Peninsula and the northern side of Hong Kong Island. Wah Fu Estate was also built in a remote corner at the southern side of Hong Kong Island, with similar concepts in a smaller scale. Plans to develop new areas were continued in the late 1960s and 1970s, when the name "New Town" was officially adopted. As most flat lands in Kowloon and Hong Kong Island had already been developed, the government proposed to build New Towns in the New Territories, a largely rural area at that time. The first phase of New Town development, which started in 1973, included Tsuen Wan, Sha Tin and Tuen Mun. With the success and experience in these New Towns, further stages of new town development were launched in subsequent decades. Up until now, nine New Towns have been built and about half of the Hong Kong population reside in these newly developed areas. After building a new town on Lantau Island in the 1990s, the pace of developing New Towns slowed down in the 2000s, owing to the lowered rate of population growth. Responding to the high demand in the housing market and the difficulty of residents buying a new home, the Hong Kong government suggested to start building New Towns again in the 2010s, hoping that could increase the supply in private housing market and provide more flats for public housing. For example, Hung Shui Kiu New Town, Kwu Tung North New Town and North Fanling New Town are proposed by the government and currently under public consultation. Land use is carefully planned in new towns and development provides plenty of room for public housing projects. Highways, tunnels, bridges and railways were built to improve the accessibility. The first few New Towns, e.g. Tuen Mun, Sha Tin, Yuen Long, Tai Po, are intended to be self-reliant, with residential areas, commercial, industrial areas as well as recreational area in each town, such that residents need not travel between the New Towns and city centre for work and leisure. 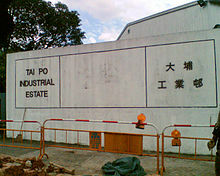 Therefore, a few industrial estates, such as Tai Po Industrial Estate and Yuen Long Industrial Estate, were built aiming at providing working opportunities to the residents in the respective New Town. Although the government successfully turned most of the town centre of the new towns into a vibrant commercial and cultural centre in the area, the overall objective to make the New Town self-reliant was proved to fail, as most residents still have their jobs in Kowloon and Hong Kong Island. The aim became unaccomplishable after most of the secondary industries had moved to Mainland China. The British government had developed new towns in the United Kingdom to help relocate displaced populations following the Second World War. This experience influenced the development of new towns in Hong Kong by the British colonial government. Before the 1950s, most of the population in Hong Kong lived in the urban area of Hong Kong, namely, the central and western part of Kowloon Peninsula and the northern coastal area of Hong Kong Island. However, the population kept booming after the Second World War. The drastic growth was due to a series of political unrest in Mainland China and the resulted large number of refugees fleeing to Hong Kong from 1950s to early 1970s and the rapid advancement of Hong Kong economy from 1970s to early 1990s. The government in the 1950s originally had no plans to deal with the housing problem of the increasing population, until the Shek Kip Mei fire, which destroyed the home of 58,203 people in a shanty town, happened in 1953. The government, for the first time, built public housing to accommodate the victims and found a change in housing policy essential. As a result, the government, on one hand, started to provide public housing to members of the public, and, on the other hand, proposed to develop "satellite towns" in undeveloped areas, in order to avail more lands to satisfy the increasing housing need. At first, Tsuen Wan and Kwai Chung were identified to be the first satellite towns, but it was found that Kwun Tong, located at the then underdeveloped eastern Kowloon, would be attractive to the residents living in the slum area in nearby Ngau Tau Kok. Thus, in the late 1950s, Kwun Tong became the first developed satellite town. At roughly the same time, the development of Tsuen Wan as a satellite town also began. Wah Fu Estate, which lay to the west of Aberdeen in Pok Fu Lam, was also built in a remote corner at the southern side of Hong Kong Island, with a similar concept in a smaller scale, in 1967. In the late 1960s and the 1970s, another stage of new town developments was launched and the term "New Town" was officially adopted. As most flat lands in Kowloon and Hong Kong Island had already been developed, the government proposed to build new towns in New Territories, a largely rural area at that time. Kwun Town, as the first satellite town, was not considered as a New Town, as it was part of Kowloon and regarded by the government as part of the urban area. The first phase of new town development was unveiled in 1973, including Tsuen Wan New Town, where full scale development was not completely unfolded as a satellite town, and also Sha Tin New Town and Tuen Mun New Town. They were intended to accommodate a few hundred thousands people respectively (e.g. according to the first planning in 1961, the government planned to accommodate 360,000 people in Sha Tin, after the entire New Town has been built; the estimated population in Sha Tin rose to even 500,000 in the planning in the early 70s). Land reclamation was carried out in the corresponding areas, so as to provide new lands to the New Towns. These newly developed towns became mature in the 80s, and provided new homes to over a million Hong Kong people. With the success of the first phase, Hong Kong government proposed to build New Towns in other areas in the 70s. The development of Tai Po New Town, Yuen Long New Town and Fanling-Sheung Shui New Town, started in 1976, 1977 and 1978 respectively. The extension of the Tsuen Wan New Town to Tsing Yi Town also started in the mid-70s, and was regarded as part of the second phase of New Town development. The third phase of new town development was proposed in the 1980s, including Tseung Kwan O New Town, Tin Shui Wai New Town and Ma On Shan, which was officially considered as an extension of Sha Tin New Town. The fourth phase of the development, so far the last one, commenced in 1996 and developed North Lantau New Town (only Tung Chung was developed although area near Tai Ho Wan was originally part of the plan), as a supporting town of the then newly constructed airport in Chek Lap Kok. At present, there are in total nine New Towns. New Town development slowed down in the 2000s, as a result of the unexpected slow population growth (actually even the development of North Lantau New Town was hindered, as the population of North Lantau New Town was just 80,000 in early 2010s, compared with more than 200,000 as originally planned). No new New Town was established in the 2000s and early 2010s and new town development was restricted to the further development of the already developed ones. However, owing to the excess housing demand since the late 2000s, which resulted in extremely high housing price and rent and the very long queue pending for public housing, government considered to build new New Towns again. In the early 2010s, the government proposed to build New Towns in Hung Shui Kiu, Kwu Tung, North Fanling and Ping Che-Ta Kwu Ling. The proposals are heat topics of public debate; if the proposals are adopted, the construction works would begin in mid-2010s and the first phase of construction would finish in early 2020s. However, the idea did not work. In the 80s, when the New Towns were developing in their highest pace, secondary industries in Hong Kong started moving to the Mainland China, where the cost was much lower, and Hong Kong gradually emerged as a commercial and financial centre in the region. As a result, most of the working opportunities remained in the urban areas, forcing residents in the New Towns to travel between the New Towns and the city centre every day. Starting from the 1990s, when there were almost no more substantial secondary industries in Hong Kong, the industrial buildings began to turn into offices, warehouse, or were even re-built as residential apartments. In the New Towns planned in the 1980s and 1990s, there were either no more industrial areas, like Tin Shui Wai New Town and Tung Chung, or just an industrial area with only high value-adding industries allowed (Tseung Kwan O Industrial Estate 將軍澳工業邨). Most New Towns were planned and developed around a Town Centre, which was the business, cultural and traffic hub of the Town. For example, one can find shopping malls, libraries, theatres, government organs, bus terminus in the town centre of Tuen Mun New Town and Sha Tin New Town. If there was a railway station, town centre was always planned in its nearby area. Tsuen Wan New Town was special in the sense that it had more than one town centre, situated around Tsuen Wan Station and Kwai Fong Station (and later Tsing Yi Station after Tsuen Wan New Town extended to Tsing Yi). The town centres of New Towns became a vibrant business and cultural hub of the area. However, it should be noted that Tin Shui Wai New Town is an exception, as it is the only New Town which does not have a clear town centre. Transportation is vitally important for the New Towns, and thus is planned with due care. Before the development of New Towns, most areas in the New Territories were badly connected. So new roads and highways were built in order to ease the traffic between the New Towns and the urban area. For example, Tuen Mun Road and Tolo Highway were two principal highways built in the late 70s and early 80s to connect the New Towns in West New Territories and East New Territories to Kowloon. Tunnels (e.g. Lion Rock Tunnel and Tate's Cairn Tunnel) and bridges (e.g. Tsing Yi Bridge) were also built to shorten the traffic time. Public transport was also developed. Most New Towns were planned with newly built railway (e.g. MTR stations in Tsuen Wan New Town, Tseung Kwan O New Town, Tung Chung and the Ma On Shan Rail for Ma On Shan). Kowloon–Canton Railway was electrified in the mid-80s in order to provide convenient transportation to Fanling-Sheung Shui New Town, Tai Po New Town and Sha Tin New Town. New Towns in west New Territories were interconnected by Light Rail Transit, although they remained the only New Towns which lacked direct railway service to the urban areas back then. Because of the lack of railway transport, coupling with the fact that Tuen Mun Road and Castle Peak Road were the only connections between west New Territories and Kowloon, the traffic between these New Towns and the urban areas was once very terrible, with serious traffic jam every day. They situation improved when Tai Lam Tunnel opened in 1998. These New Towns in west New Territories were finally connected to urban areas with direct railway service, when KCR West Rail (now West Rail Line) opened in 2003. There are both private and public housing in the residential areas in New Towns. However, Tin Shui Wai New Town, especially the northern part, was primarily packed with public housing estates. This was widely regarded as a planning error, as it significantly hampered the economic development in Tin Shui Wai, owing to the lack of middle-class family in the area. Not enough business opportunities were available, and the problem was magnified by the fact that the area was resided by high proportion of newly migrated families, who usually earned an income lower than average. The government was well aware of this problem and tried to prevent such a problem in the planning of new New Towns. Land reclamation was a major way to acquire new lands at the initial development of the New Towns. Large area of lands were gained by land reclamations in Sha Tin, Tsuen Wan, Tuen Mun, Tai Po, Tsing Yi, Ma On Shan, Tin Shui Wai, Tseung Kwan O and also Tung Chung (7 of 9 New Towns, with Fanling-Sheung Shui New Town and Yuen Long New Town the only exceptions). ^ a b c d "Historical Background". www.pland.gov.hk. Retrieved 2018-03-20. ^ a b "Factsheet" (PDF). gov.hk. ^ "Historical Background". www.pland.gov.hk. Retrieved 2018-03-20. ^ a b "Historical Background". www.pland.gov.hk. Retrieved 2018-03-20. ^ "Development Phases of North Lantau New Town". www.pland.gov.hk. ^ "North East New Territories New Development Areas - The Study". www.nentnda.gov.hk. Retrieved 2018-03-20. ^ Scott, Ian (1982). "Administering the New Towns of Hong Kong". Asian Survey. 22 (7): 663–4. doi:10.1525/as.1982.22.7.01p0395f. ^ a b "Planning Concepts". www.pland.gov.hk. Retrieved 2018-03-20. ^ "Government Planned Development". www.pland.gov.hk. Retrieved 2018-03-20. ^ "Planning Concepts". www.pland.gov.hk. Retrieved 2018-03-20. ^ "香港地方 | 地方 | 填海工程". www.hk-place.com. Retrieved 2018-03-20. ^ "Reclamation & Development in Hong Kong 1996". ^ "Result of North East New Territories New Development Areas Planning and Engineering Study (with video)". www.info.gov.hk. ^ "Tung Chung New Town Extension Study".